Hula Hooping Mom: Halloween Costumes! **Disclosure: This is a partnership with USFamilyGuide.com. No monetary compensation was received. We did receive a gift card to experience the site ourselves. It's that time of year already! This is one of my husbands favorite holidays! He loves to dress up and have fun with the kids. HalloweenCostumes.com is one of the largest costume retailers on the web. Their comprehensive collection of costumes is specially selected to fit all needs, budgets, and occasions. 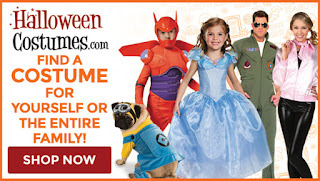 HalloweenCostumes.com are a passionate group of costume and Halloween fanatics who are devoted to providing quality customer service and, above all, great costumes. After you have found the perfect costume or costumes you want for Halloween or your next theme party, you can feel safe and secure placing your order with them, knowing that they are Hacker Safe, Verisign Secure and certified by the BBB. Find the coupon by clicking here!